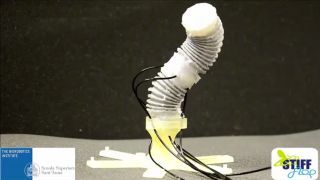 A flexible robot arm, aimed at improving surgical operations and filled with coffee granules, has been constructed by scientists in Italy. The 14-centimetre-long tentacle has no rigid inner skeleton. Instead, it has a central tube with chambers that can be pumped full of air to varying degrees to lengthen or bend the arm in different directions. In the middle of the tube is an additional chamber filled with coarse-ground coffee. When air is sucked out of that compartment, the coffee granules jam together and the arm goes rigid. The goal is to provide a tool for surgeons hoping to perform minimally-invasive surgery. "Traditional surgical tasks often require the use of multiple specialized instruments such as graspers, retractors, vision systems and dissectors, to carry out a single procedure," lead author Tommaso Ranzani, from the Sant'Anna School of Advanced Studies in Pisa, told the BBC. "The human body represents a highly challenging and non-structured environment, where the capabilities of the octopus can provide several advantages with respect to traditional surgical tools," he added. The design was published in the journal Bioinspiration and Biomimetics.